Today I’m going to talk about what I’ve learned over the years about “dieting for health”. Over the years I’ve experimented with a number of different approaches, and have settled on a program that I call my “Reset Diet” (if there is an official diet out there with this name, mine is not associated with it). I call it my Reset Diet because it resets my habits, it breaks my food cravings, and I think (but I have no proof) that it resets my gut bacteria back to the way it should be. I do this short term diet every few years, and it gets me on track again with my health. I find that this approach produces tremendous results in a very short time. I have to say that I am not advising this diet for you. I’m just telling you what works for me. A few months ago my doctor told me that my blood tests showed that I had a slightly fatty liver, which he said was due to what I was eating. The numbers weren’t through the roof, but he was concerned enough that he wanted me to start on medicine to take care of it. I want to avoid medicine if possible though, so I told him to give me some time to correct my diet. So I started my reset diet 28 days ago. In that time, I’ve lost 17 pounds and my blood numbers improved considerably. My blood levels do not show a fatty liver anymore. My LDL cholesterol is way down and my triglycerides have fallen from 167 to 61! That’s more than 100 points! My doctor was amazed. In addition to this, I am sleeping much better and I feel better. I hate the term “diet”. I typically focus on eating right in a general sort of way, and I try to avoid chemicals and additives, but that’s it. I don’t monitor calories, etc. For the most part, I think my approach is good enough. But over time, I have to admit that laziness sets in and my habits start to slide. For the past year or so I’ve developed some bad habits, the worst of which was my late night snacking. I looked forward to my midnight snack. And over time, it started getting bigger and bigger and the sugar content went up. This really messed with my sleep. For the past year at least, I think I’ve been chronically sleep deprived. But I also got addicted to certain foods. The weird thing about food addictions is that your body seems to get addicted to the foods it can least handle. Often times it’s foods that you actually have allergies for. And these cravings can be very strong in some people (some people don’t seem to have this problem). So when people say that you should just “listen to your body”, that’s not always good advice. Some people say that this is caused by your gut bacteria, and if you eat the wrong types of food it causes bad types of bacteria or yeast to grow in your gut, and these third-party organisms actually control your “desires”. So they are sending bad desires to your brain. This is one of the reasons that it’s sometimes hard to make incremental changes in your diet. These other organisms in your gut have taken over control of your desires. But, from my experience, I can reset the bacteria in my gut and restore the proper balance of bacteria, which in turn controls my cravings again. Willpower requires a lot of mental energy. The most important thing that I’ve learned though is how my brain works. Basically it comes down to the fact that habits and cravings are much more powerful than willpower. Anything that depends upon willpower for success can have short term success, but in the end, it will fail. It’s like autopilot in a plane. If you have autopilot engaged in a plane, you can take a hold the controls and change the path, but as soon as you let go of the wheel the autopilot will take control again and resume its programmed path. Autopilot (your habits) will win in the end. My Reset Diet allows me to reprogram my autopilot without relying much on willpower. Willpower actually requires mental energy, and this mental energy gets depleted towards the end of the day. The more you tax your willpower, the faster your reserves will be depleted. Eventually it results in the backfire effect. Any time your brain has to decide or make a judgement, it’s using the part of the brain that requires willpower and it uses up your reserve energy. For example, if you have to make a decision such as, “should I eat this now?” or “maybe I’ll have only one piece of cake”, you are making a decision, using judgement and negotiating with yourself. This exerts mental energy. I’ve found that the key to solving this is to put yourself in the position where you don’t need to use willpower. Instead, use “Clear Lines”. The concept of “Clear Lines” is simply that you draw lines in the sand and don’t cross these lines. For example, if you were to say, I’m not going to eat anything from 8pm until 8am, that is a clear line. There is no negotiation. There are no exceptions. It quickly becomes a habit and your brain doesn’t even challenges these lines anymore. In other words, you remove the judgement part of your brain from the equation, thus it doesn’t tax your mental energy. • Three meals a day. No snacking. Nothing outside of this timeframe except for water or tea. • No calories from drinks. It’s too easy to get a lot of calories from drinks, such as pop. • No sugar, no bread, no pasta, no potatoes or carbs other than veges. • Dinner is around 6pm. Nothing after 7pm. For the first week or two, the only thing I consume is a specific type of shake, called Almased. That’s it. Breakfast, Lunch and Dinner = Almased. But here’s the thing, when I consume Almased, I do NOT get hungry, ever. 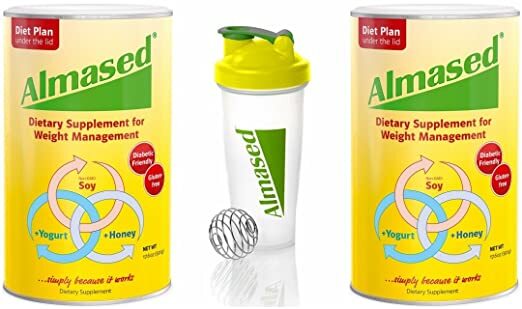 Almased is one of the most scientifically studied nutritional shakes on the market, and it is the only one that I have found that leaves me with zero hunger. Yes, I miss food during this time, but missing food is different than being hungry. I can deal with missing food for a short period of time. In fact, it makes food that much better when I do start eating again. And really, when I think about it, it’s worth it to sacrifice a week or two of enjoyment to dramatically improve my health. Now, when I do these clean breaks, I may get a mild headache for a little while. Whether this is due to a flushing out of toxins, or a withdraw from food addictions or some people say it’s due to the bad yeast dying off in your gut, whatever it is I feel it as a “Good” headache. It’s like going to the gym, working out hard and then having the “Good” pain in your muscles which means growth. GRADUALLY ADD MEALS BACK IN. After a week or two of consuming only Almased for every meal, I switch to Almased for breakfast and lunch, and then for dinner I have a real meal. This meal consists of veges and some meat and fat (more on what I eat below). Luckily for me, my wife is a fantastic cook and she spoils me with terrific food for these meals. And I’ll tell you, after not eating real food for a week or two, I REALLY appreciate that meal. I stick to this “two-Almased, one-meal” for another three or four weeks. Then I add in another meal for lunch, so it’s “one-Almased, two-meals”. Then I stay on this for a month or longer. After this time, which is usually about three months later, this routine is fairly established. I feel good and this is how I like to live. After a period of time, I may slowly develop some bad habits again, but I try to keep as many of the clear lines in place as possible. As you know, there are tons of different philosophies on what to eat, from vegan to Mediterranean to paleo. For me, I’ve had best results from the Primal Blueprint diet, which is close to the paleo diet. This calls for a lot of veges and some meat and good fats. Low carb, no sugar and not a lot of grains. I stick to this during my Reset Diet, and then I relax a little bit and try to go more towards the Mediterranean Diet. Do your own research on this. PREBIOTICS, TUMERIC AND FISH OIL. At all times during my Reset Diet, I add in pre-biotics, turmeric and fish oil. Prebiotics are different forms of fiber that go through your intestines and make it deep into your digestive system. These are very good for supporting your gut bacteria. Note: I’m not talking about probiotics, which are capsules filled with bacteria, but rather pre-biotics, which help create the right environment for your bacteria to thrive. I believe that Tumeric is also very important. Last time I wrote you I shared information on a study that showed the dramatic effect that Tumeric had on fatty liver. I’m sold on it. I also take a tablespoon of good fish oil periodically. As you know, I talk a lot about water and the importance of having good, clean water. I believe that the single most important thing you can do for your health is to only drink high-purity water. The fact is, we live in a toxic world and these toxins can end up in our water supply and we can drink them for years without having any idea of what we are consuming. This is what I recommend for purifying your water (click here). I’ve found that the best diet is the one that takes the least amount of energy. While this diet is intimidating, I find that it is actually very simple to do and requires very little emotional or mental energy because my main goal is to retrain my habits. As a final point, what you eat and how much you eat has a huge impact on your health. I don’t claim to be an expert at this, but I have done my research and I’ve figured out what works for me. It seems to me to be a small price to pay in order to keep your health up. I’m always open to new ideas though, so please tell me what you’ve discovered that works for you. Put it in the comments below. P.S. I have to say again that I am not giving medical advice. Do your own research. Great comment Elaine! Thank you! 30 day water-only diet?! Wow. That is tough.